The National Center for Educational Statistics estimates close to twenty thousand deaf and hard of hearing students attend higher education each year. College itself is a new and challenging time for students, but may be more so for students with hearing loss. Reports have shown that hard of hearing students are more prone to falling behind in reading and math. As hearing loss can seriously affect a student’s academic success, institutions receiving federal funding, including all public colleges and universities, are required by law to provide equal access and accommodation to hearing-impaired students. Furthermore, there has been improved technological accommodations that improve the learning environment for students with hearing loss. Adaptations within the classroom by instructors also improve learning environments. As much as there is external support for students, it is equally important to research, gain knowledge, and be proactive in your education. Any higher education institution that receives federal funding is required by law to be accessible to deaf and hearing impaired students. Generally, the disability student departments will provide special accommodations to hard of hearing students as their mission is to ensure equal access for students with disabilities to all curricular and co-curricular opportunities. 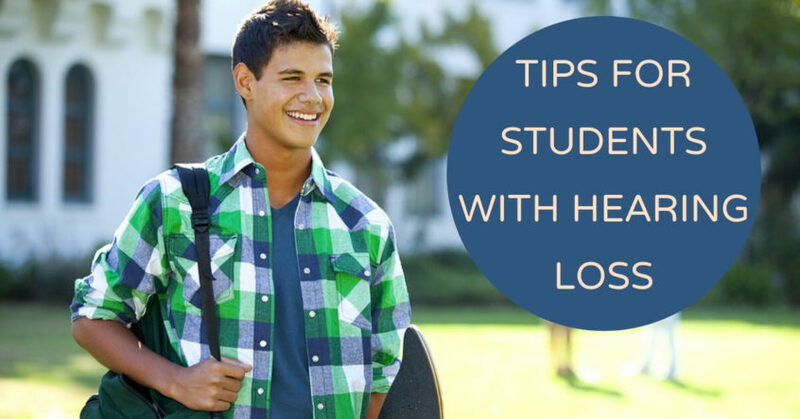 Students who intend to seek out accommodations, it is recommended that they receive a complete hearing evaluation and diagnostic description from their audiologist. The Americans with Disabilities Act requires all higher education institutions to provide students with hearing loss assistance and equal access to all activities and curriculum. But what type of assistance and accommodations are available? The following are a list of the most common hearing assistive tools used by college students with hearing loss. Inductive Loop Systems are systems that use electromagnetic fields to deliver sound. A speaker’s voice is transmitted from a microphone through something called an induction loop to a telecoil into a users’ hearing aid. FM Systems are radio broadcast technologies that are used to transmit a speaker’s voice directly to a student’s hearing instrument. Infrared Systems use infrared light to transmit sound. Through usage of a receiver and earphones, sound is transmitted. If there is any obstruction to the light, the sound will be disrupted. Communication Access Real Time Translation (CART) is a system that translates speech to text through “captioning”. Real-time text is delivered onto various systems such as laptops, smartphones, and even on projection monitors. This system is quite expensive, so not all institutions will invest in this resource. By law higher education institutions must provide this service if a student requests it. Outside of the aforementioned technological accommodations, students with hearing loss could also access e-textbooks that provide online versions of textbooks that provide additional interactive features. Hard of hearing students could also use digital recorders to be able to record lectures, discussions to be able to replay at a later time. This helps students who may miss any important details to review the material at their own pace. Equally as important to assistive listening technologies, classroom adaptations can greatly enhance a hard of hearing students’ academic success. Students with hearing loss should know that they should take the responsibility to inform their instructors of classroom modifications that they may require. One way of improving the lecture is through adaptation of instruction. Students facing hearing loss should reach out to instructors before class to address accommodations for the course. This includes instructors facing the class, incorporation of many visual aids as possible during lectures, as well as repeating questions and comments so hard of hearing students could comprehend the discussion. Modifying materials is another way that can assist students with hearing loss. For example, altering oral exams into written exams, discussion and participation can be shifted to written responses to accommodate students with hearing loss. By providing interpreters, personal note-takers, and additional time to complete exams or in-class work can greatly enhance hard of hearing students’ academic success. It’s important to understand that there are resources and accommodations for you if you are a student with hearing loss. On-campus support provides crucial information and access to resources to help you succeed in higher education. Furthermore, there are specific scholarship and grants that are available to deaf and hard of hearing students. These include: R. Orin Cornett Memorial Scholarship, Graeme Clark Scholarship, Help America Hear Scholarship, and the Dorothy E. Ann Fund (D.E.A.F.). If you have any hesitation when it comes to higher education as an individual with hearing loss, reach out to Hearing Aid Associations to help you explore your options! Why Do People Shy Away from Treating Hearing Loss?